The Deronda Review, vol. VIII no. I (2019) may be read or downloaded in .pdf format here or in .html format here! From Middlemarch to Daniel Deronda. George Eliot's social vision, and why her last hero had to be Jewish. Nature and Circumstances, or Limited Goods: A Rereading of Mansfield Park. A look into the depths of Jane Austen's most introspective novel, which still has social relevance. The Street of Nathan the Wise examines an eighteenth-century German play that still explains a lot about the situation of the Western world, and of Judaism within it. Epistle to ISIS, by Sivan Har-Shefi, is posted here. Yoram Raanan's Art of Revelation, a stunning album of paintings on the weekly Torah portion, is available here. Yaacov David Shulman's two books of poems inspired by passages from HaRav Kook, Airport Lights and Backstage Lights, are available on Amazon. Ruth Fogelman's latest book, Leaving the Garden, is available on Amazon. A review of Yoram Hazony's book God and Politics in Esther--a thought-provoking book for all seasons--is posted on Amazon here. Esther Cameron's book on Paul Celan is now in print; information here. Shira Twersky-Cassel's fourth book of poetry, Legends of Wandering and Return, has been published by Sifrei Bitzaron. Information on the book, with excerpts, may be found at www.bitzaron.com. Mindy Aber Barad's first book of poetry, The Land That Fills My Dreams, has been published by Sifrei Bitzaron. See the front and back cover and sample poems here! Constance Rowell Mastores' A Deep and Dazzling Darkness has been published by Blue Light Press. See Amazon reviews here. A second book, Dusk, has been published by Sugartown Press. To many members of the DR circle, Rabbi Dr. Zvi Faier zts"l has been a dear friend and a powerful source of inspiration. Dr. Faier's book A Day Is a Thousand Years has now appeared in print, offering all of us the chance to continue the conversation. Our review may be found here. For creative women, rooms to rent on a daily, weekly and monthly basis in a beautiful country setting 1/2 hour from Jerusalem. Contact nsgaula@gmail.com or 224 365-5860, in Israel 02-9913842. For a new anthology of sonnets, edited by Richard Vallance Janke, check the homepage of Phoenix Rising from the Ashes. Illustration: Lighthouse, by Irene Frenkel. 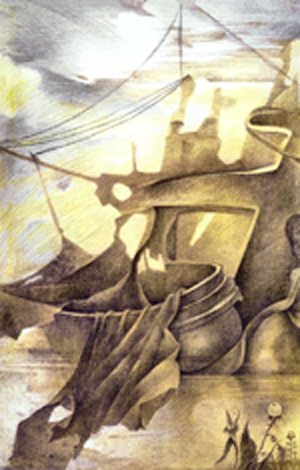 Drawing (16" X 12", pencil and coffee stain), circa 2000.